Before we left Switzerland, one piece of advice we repeatedly received from advisors and friends who had spent time in Asia was: "don't overthink it; sometimes, you'll just have to go with the flow". Looking back on the past 8 months, we have applied this nugget of wisdom time and time again; among the first times was last spring, when our post-China plans to travel across Nepal and work along the way were vague at best. One day in Mongolia, our paths crossed Martin Wikelski's, a renowned animal migration specialist, all-round explorer, and generally genial person. One thing led to another, and soon we received an invitation to visit Martin's collaborators in Bhutan, to do quantitative ecology & science communication work at the Ugyen Wangchuck Institute for Conservation and Environment (UWICE), in the remote valley of Bumthang. "Go with the flow"... We didn't hesitate very long before swapping Nepal for Bhutan on the Slow Motion journey from China to India; and we haven't regretted it for a minute. Bhutan is a very unique country; a tiny landlocked Himalayan kingdom squeezed between two enemy giants (India and China), it wasn't connected to the rest of the world (no television or Internet) until 1999. Even today, the government levies a heavy tax on foreign tourists (as we were on a governmental mission, we were lucky to have this tax waived), effectively restricting the access to a fortunate few, and preserving the country's sacred and pristine character. The wild beauty of the Thunder Dragon Kingdom (as the country is known), and the kindness of its people, would amply justify a blog post; but Slow Motion Projects is not a travel blog, and our main goal wasn't to explore Bhutan's mountains and culture. We came to UWICE to work during a short four-week stay at the 3000m-high Lamay Goempa campus in Bumthang, and this post is a summary of our actions. We teamed up with the UWICE communication and media department to critically assess the structure, content, and visualisation of the institute's website. We wrote a detailed report containing clear recommendations for the team to increase and improve the online reach of the institute's work, through their website and on social media. The full report can be read here. Dhur Tsachu (hot spring) in Bumthang. In addition, following a request from the same department, we focussed on a book recently published by UWICE on the Tshachu and Menchu (hot springs and mineral springs) of Bhutan. We wrote a set of recommendations to create an interactive online version of the book, so the results of the hot spring census can reach a much larger audience than the paper version. The report on this project can be downloaded here. Himalayan griffon vulture carrying a telemetry backpack. Picture courtesy of Ugyen Tenzin & Max Planck Institute for Ornithology. Himalayan griffon vultures (Gyps himalayensis) are migratory birds who travel annually thousands of kilometres from North- to South-Asia between breeding and wintering sites, and in doing so fly over the Himalayas at heights above 6500 metres. The behavioural and physiological adaptations required to fly in such thin air are poorly known. To elucidate these mechanisms, and shed light on the migratory behaviour of this threatened species, UWICE researchers have equipped a dozen of these birds with telemetry backpacks comprising a GPS receiver, 3D accelerometer, and a number of environmental sensors. At UWICE's request, we applied machine learning techniques to automatically characterise the behavioural states of these birds (flying, resting, feeding, etc.) from telemetry data, in order to reconstruct their migratory strategy. Even in a short time span, we were able to outperform a previous research benchmark, and more importantly train the institute's staff on the application of machine learning in ecology. The full report on our study, as well as the associated research code, can be found here. Analysis of phenological (related to ecological cycles) data collected by Bhutanese schoolchildren. 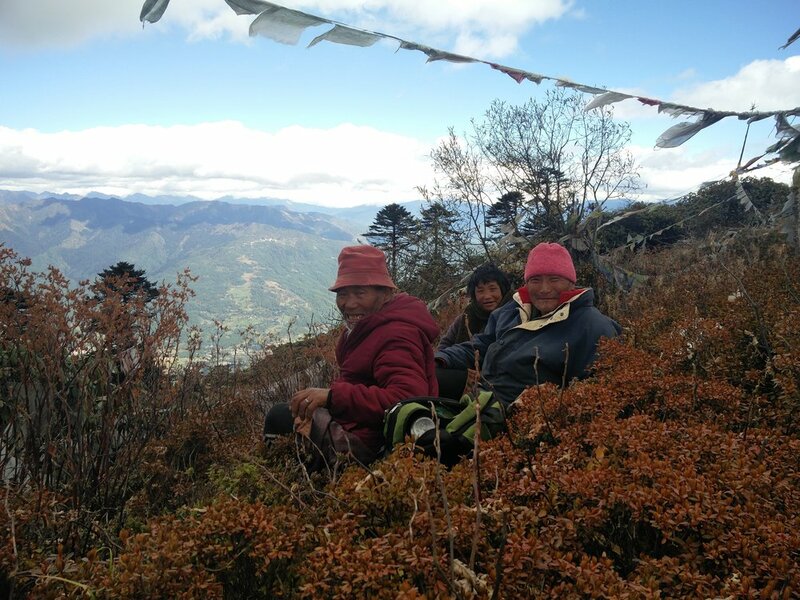 UWICE is also leading the HEROES (Himalayan Environmental Rhythms Observation and Evaluation System) initiative, a citizen science project through which children from all over Bhutan collect environmental data to monitor the impact of climate change on local wildlife and plant ecosystems. We trained the institute's staff on modern data analysis and visualisation techniques; this will allow them to update their online platform, so the children can explore by themselves the data they have collected, and understand among others the delaying effect of global warming on country-wide blooming patterns. Our visualisation work can be found here. 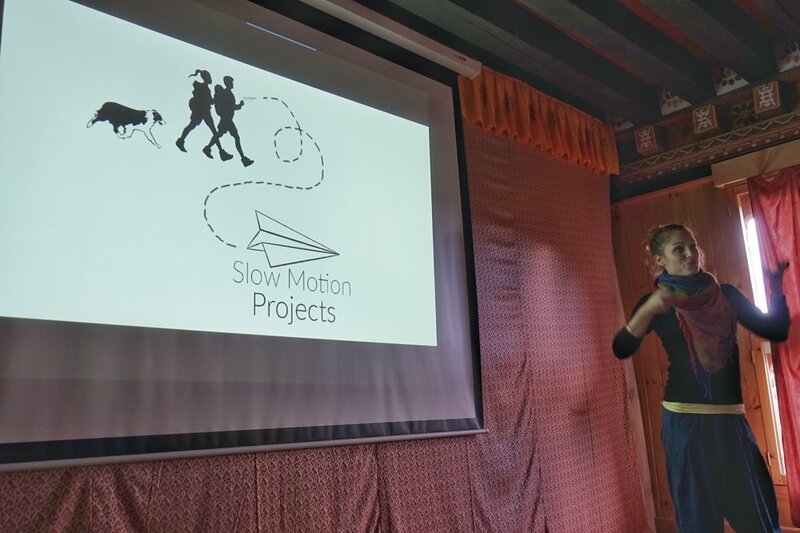 Towards the end of our stay, we held a seminar at UWICE to describe our results, and present Slow Motion Project's mission. As you know, this mission is an educational one: we aim to bring environmental teachings to as wide an audience as possible. Sometimes, this means simply taking children to a national park and telling them about the wonders of nature. Other times, we leverage our scientific and communication background to directly support the action of environmental researchers. Though they answer different needs, we believe that these actions are equally important. Across the breadth of our initiatives, and the diversity of the places we work in, there is one constant: your continued support. Thank you!